Olive green is one of my favourite colours. I have extreme difficulty resisting clothing made in such. 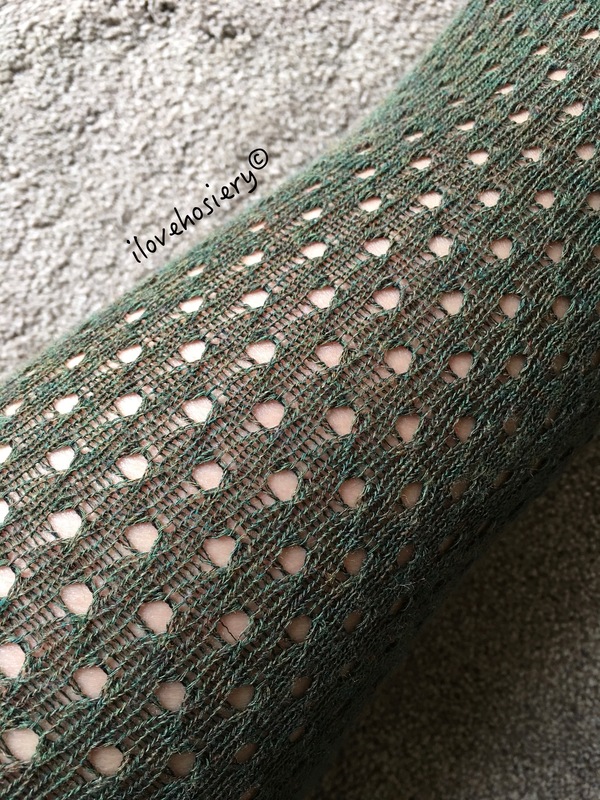 When I saw Genna tights, I knew I will one day write a review about them. ⊕ Open-knit provide good balance between warmth and breathability. ⊕ Tag on the inner rear to differentiate between front and back. Genna is matte tights in open-knit fashion. It is one of Fogal’s AW 16/17 collection. The fine ajour runs vertically from the waist to the feet and sole. The knitted waistband measures 2.5cm wide. There is a tag at the inner rear of the waistband, which has Fogal logo printed on one side and the size on the other. 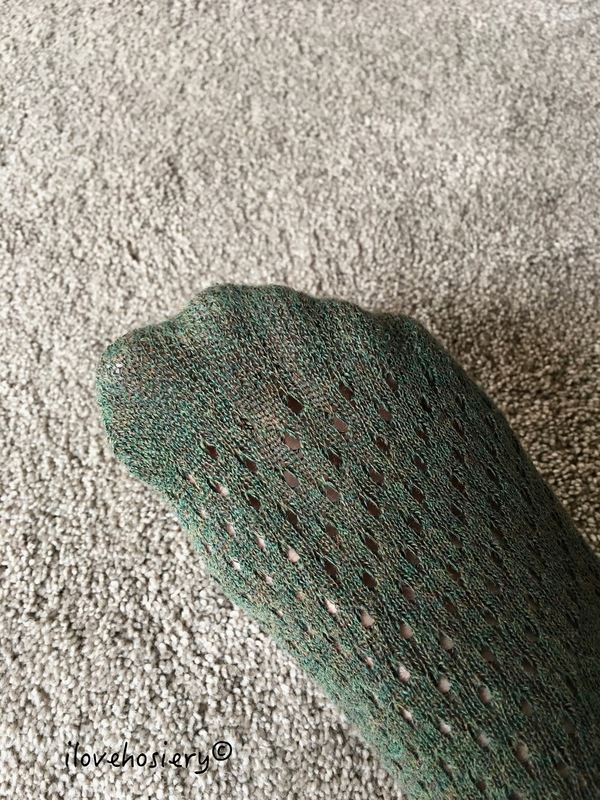 There is also a knitted cotton gusset and a reinforced toe (not open-knit). The composition is 78% viscose, 11% nylon, 9% cashmere and 2% elastane. 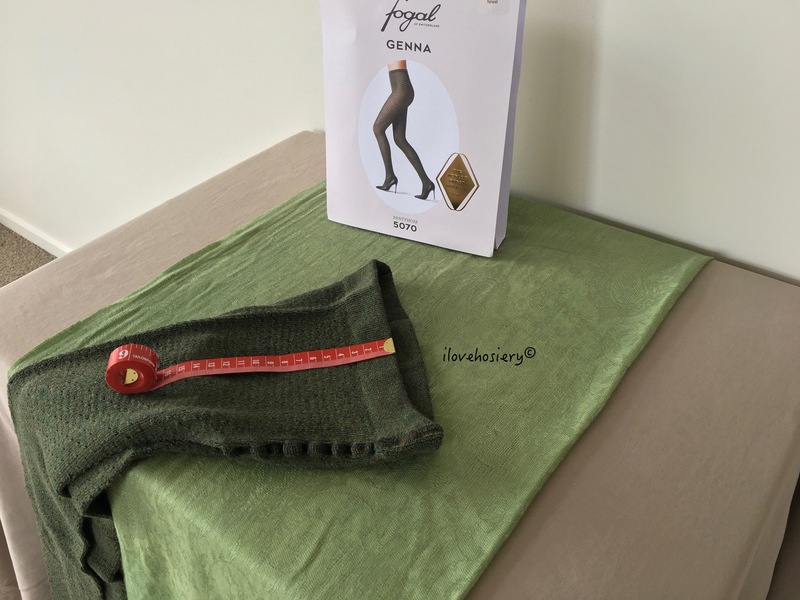 Fogal Genna Tights promotional image. Tag at the inner rear of waistband. Genna tights comes in all sizes including M EXTRA and L EXTRA. I have used size M in this review. I bought Forest colour for this review. It has a olive greenish hue. You may also find other colours such as black (subject to availability). 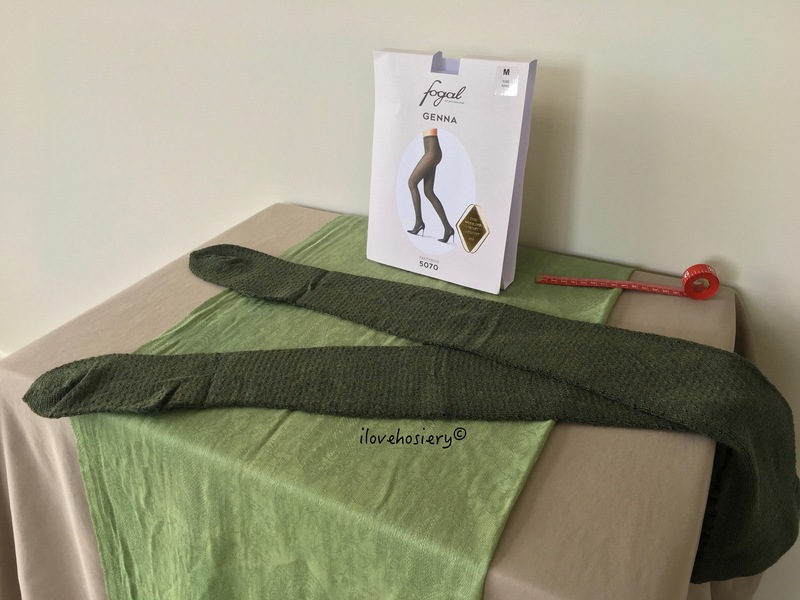 The fit was fine and the knitted waistband was very comfortable. The envelopment was a bit loose though. The hose didn’t hug the legs as well as Fogal’s sheer tights. May be the natural fibres do not have sufficient elasticity and there was not enough elastane. Fortunately, the tights didn’t bag around the knee. Personally, I like the look. The colour distribution was even and appeared in high quality. The tights also has a thick looking. If you have curvy legs, it could make your legs look even more curvy. The first impression was the tights were thick, thicker than a 50 denier opaque tights. It was like wearing socks made of cotton and wool. The legs became warm pretty fast. Yet, there was a good balance of warmth as heat can be released through the openwork. The texture was relatively smooth and soft. Hence no uncomfortableness for the skin or at the sole when walking. The reinforced toes meant it was more comfortable for the toes (as opposed to holes) and could last longer. 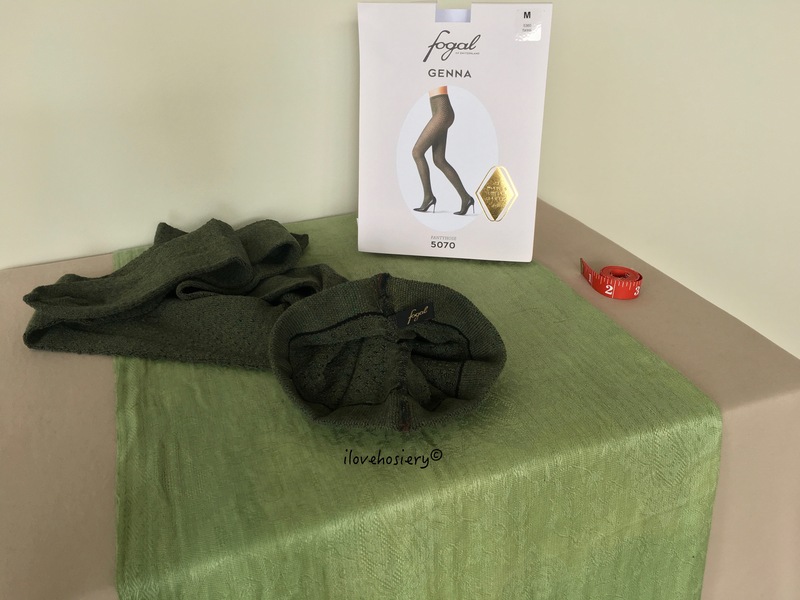 This is the second time I found a tag on Fogal hosiery (the first being Ivette Leggings). I find the tag helpful for me to differentiate between front and back. It would be even better if Fogal include the name of the style somewhere on the product. Customers can then trace the the style they like the most and make repeated purchase. I actually bought two pairs. First for my partner and after a while, a pair for myself, so we can wear them together during colder days. I prefer these open-knit tights than the opaque ones for their breathability. Since Genna tights are from last year’s collection, the availability is very limited. You may want to check out your local retailers if you are interested in them.